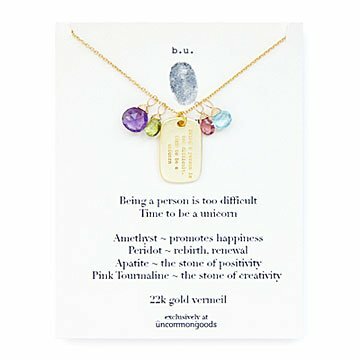 This charmed necklace features a playful unicorn quote and four gemstones associated with positive energy. Is real life getting you down? Maybe it's time to bring some more magic into your world with this enchanting necklace from jewelry designer Mary Steratore. She makes its central pendant from 22k gold vermeil, and engraves it with a whimsical quote: "Being a person is too difficult. Time to be a unicorn." Flanking that pendant are four gemstones traditionally associated with positive energies: amethyst (happiness), peridot (renewal and rebirth), apatite (positivity), and pink tourmaline (creativity). How could you not feel charmed with access to such magical powers? Handmade in Pennsylvania. I have not yet given my sister this treat. I am having fun thinking about how great it will be to give it to her. She will get the concept and I hope she will embrace it as well. A Beautiful and Fun Gift! I bought this for a friend who enjoys Unicorns! I loved the fun message of the gift and think she will enjoy it! Dog tag is much smaller than ot looks in the catelogue, bit not a bad thing. It can be worn with other necklaces without overpowering them. Fits my grandchild to a "T"
This necklace is so pretty and the words about being a Unicorn when life gets too hard are perfect spirit lifters. It's short and delicate so can easily be worn alone or with other necklaces of different lengths. One of the best gifts I've given myself lately! It's so delicate, the quote is almost like having a little secret around your neck! Received this as a gift and love it! Love that the message is small. Almost like the thought in your head to yourself that no one else gets to hear. It's a great product I would buy pieces from the company again. I sent this to my daughter as a surprise and she was delighted!